Between elcor, microgestures communicate everything, which means elcor are accustomed to reading everyone’s microgestures and body language. While other species don’t use microgestures as a primary way to communicate, those gestures can still be analyzed by the elcor. Yorrik let out a small trumpeting squawk of indignation. Three of his stomachs curdled. Had the hanar a nose, it would have gagged from the stench of hot soup and rotting fruit that flooded the room as the elcor’s humiliation reached his scent glands. But What of Their Language? Calyn, the elcor ambassador in Mass Effect 1, told Shepard: “Our people communicate less through words and more through scent and slight movements.” So they do use words, just not as extensively as other species do. When Shepard stumbled upon Calyn talking to another elcor (Xeltan) on the Citadel, the two speak without prefacing their thoughts. The irony is that, while their actual language is extremely nuanced and full of subtle meaning, they are unable to modulate their voice to convey the meaning they want. They sound emotionless, regardless of what they actually feel. In order to convey their meaning to other species, they preface every thought with emotional context. They’ve gained a reputation as a slow and deliberate species as a result. 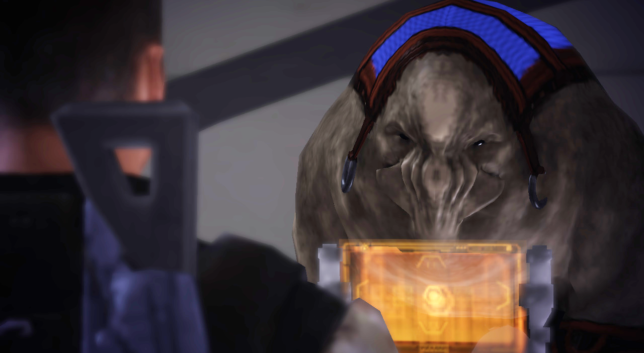 In the Citadel DLC, an elcor sent Shepard an email. They didn’t preface their thoughts at all. It’s not inconsistent with everything we know about them. In writing, they don’t have to worry about sounding emotionless. But it does seem to indicate the speech technique can be a bit of a bother to some elcor. 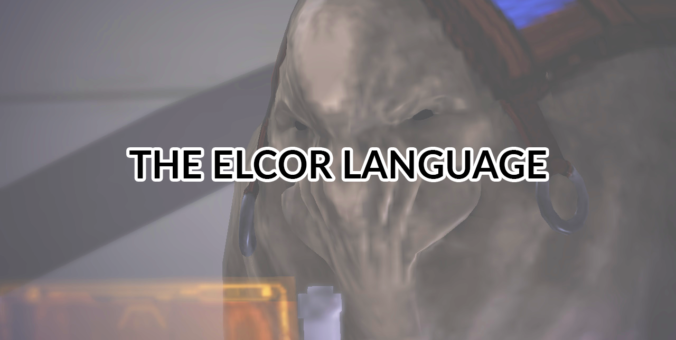 There is a theory that the technique used by the elcor is automatic, meaning they can’t control the way they preface their sentences when translated. The reason behind this theory is a dialogue between an elcor and an asari customer on Illium during ME2. Asari Customer: Did Viranis say the omni-gel modulator’s heat sink from this tech shop, or the heat sink modulator? Elcor Customer: With deep respect: I’m sure he would never confuse the two. Asari Customer: Wait, did you hack your translator so you can control your kinetic language processing? Elcor Customer: With a sincerity such that skepticism would be deeply insulting: no. She clearly believes that he cannot be sarcastic or lie, therefore his translator has been hacked. I believe the issue is that she doesn’t realize the technique is just that, a technique. It’s possible not to use it. It’s also possible for an elcor to be extremely sarcastic and not always speaking literally. “With overwhelming joy” can mean the opposite, as can be read in Annihilation. Furthermore, in Annihilation, Yorrik is quite insulted when a character tells him they thought elcor couldn’t lie. He replies that elcor can be actors. The implication is that they can control their speech technique and are able to lie. The translator is not directly translating their kinetic language. Can Other Species Use the Elcor Speech Technique? Yes. Some elcor (like Yorrik’s grandfather Verlaam) believes other species could benefit from using the elcor speech technique, especially in times of great stress. Verlaam received many visiting veterans of all species who came to learn the technique since trauma prevented them from expressing their emotions. 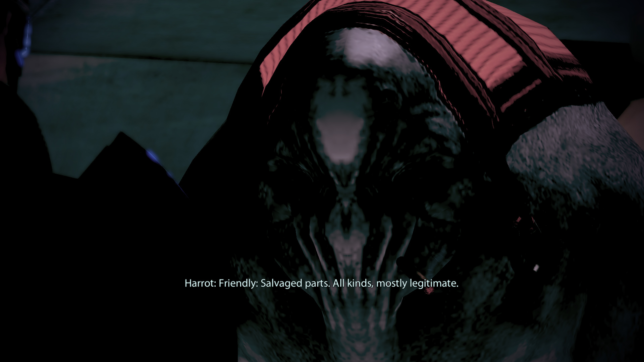 The elcor Harrot on Omega being friendly.